Many of you will know that come Yule-tide, I love to share my home baked mince pies. My love of baking and love of fitness don’t always go together but since it’s Christmas, it’s time to marry the two and bring you my mince pie workout. According to Waitrose, their all butter mince pies contain 234 calories each … gasp! So one mince pie, plus an obligatory glass of champagne (90cals in the average glass) = 324 calories. How can we burn off 324 calories in our super shopping mince pie workout? Let’s say the average last minute Christmas shopping dash lasts 45 minutes. 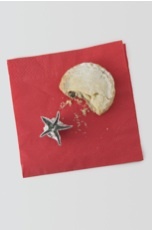 According to the Mince Pie Calculator (yes there is one – provided by http://www.livingstreets.org.uk/mincepiesatwork/) a 10 stone person walking for 45 minutes at a slow pace burns on average 109 calories, crank up your speed and you could burn 253 calories, so get moving! “But what about the other 65 calories?” I hear you cry. According to Australian nutritionist Matt O’Neill (www.smartshape.com.au ) caffeine before a workout can help you burn 30% more calories. So grab an espresso en route and you could turn your 253 calories into 329.